The MAHB gives a place of honor to history painting, with this work inspired by mythology. 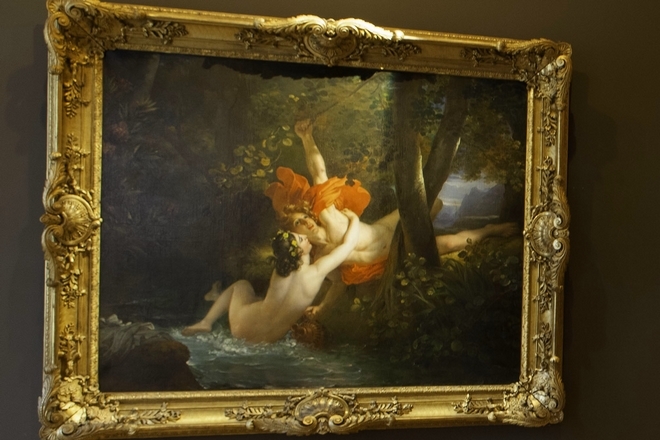 Hylas and the nymph, executed by the "king of painters and the painter of the kings", is an order of 1824 for the palace of Tuileries, a royal residence. As a painter of history, François Gérard shows in this composition his talents as a portrait painter and landscape painter. Because of the dimensions considered too small, the painting will finally remain in his workshop. Painted around 1826, this oil on canvas entitled Hylas and the nymph oscillates between neoclassicism and romanticism. The subject from Greek mythology presents an episode of the expedition of the Argonauts, in search of the Golden Fleece. During a halt, Hylas, son of the king of Dryopes, is kidnapped by the Naiads, seduced by his beauty. This painting is part of the donation of Henri-Alexandre Gérard, nephew of the painter. In 1899, he offered the city of Bayeux 37 paintings from his collection to contribute to the creation of a municipal museum that will take the name of Baron Gerard Museum in 1959.